Calculating median and mode values for a dataset in MySQL is more complicated than you might expect. Sure, there is the avg function to calculate mean, which is simple to use, but what about finding the median or mode average values? There are no equivalent functions in MySQL, so we have to work a bit harder to compute these values. There are many ways to do this. 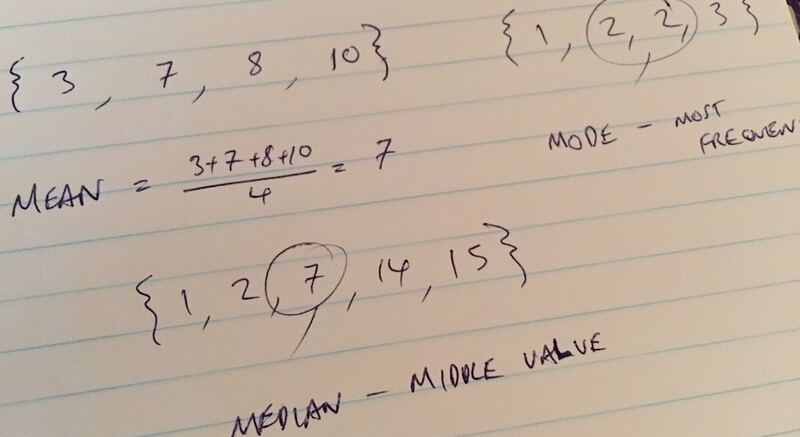 Below I show the approach I take to calculate mean, median and mode values, along with sharing some resources at the end of this post that continue the discussion on the merits of different approaches. The mean is the “average” that we’re all familiar with, the one we usually refer to when we say “average”, and it’s calculated as the sum of the values divided by the count of the values. To get the answer to 2 decimal places, I can wrap a format function around the avg function, as shown below. In this example, I’ve called the column “mean” using the as statement. Median is the middle value, the numerical value that separates the higher half of the data from the lower half. Step 1: create an intermediary table where the data is sorted and numbered. This creates a table with the data sorted from smallest to largest with each row numbered from 1 to 100. We created a variable (called counter) and then incremented this by 1 for each row. The final line of the query orders the data by column 2, i.e. the test value. Step 2: The second table we need for the median calculation is a simple count to determine the total number of rows of data in our dataset. Step 3: as a baby next step, let’s calculate the median for the specific case of our test data, where we have exactly 100 values in the dataset. Note, this scenario calculates the median for an even number of rows, by finding the middle two rows and taking the mean value. Here, I order the data as per step 1 (inner subquery) and then I take the average of rows 50 and 51, to calculate the median (see lines 1 and 7, the outer wrapper). Step 4: adjust calculation to account for any number of table rows. So far, we’ve looked specifically at 100 rows of data, i.e. an even number of values. Recall, it’s simpler for a dataset with an odd number of values: then it’s simply the middle value. We modify the preceding query in step 3 to be more general by replacing the (50, 51) set with a subquery to determine the total number of rows and then a calculation to find the middle values. We use the table from step 2 to calculate the total number of rows of data. Then we specify that our row_id must be the middle value (odd number of values) or the two middle values (even number of values), using the floor() MySQL function, which returns the largest integer not greater than the argument. to find the middle value or values of our dataset. The mode is the other average value, representing the most frequent value in a dataset. This is achieved in MySQL using the count function to identify the most frequent values in the dataset. Step 1: count the frequencies of values in the dataset, by grouping on the value and using the count function. However, let’s continue and flesh out a full query solution. 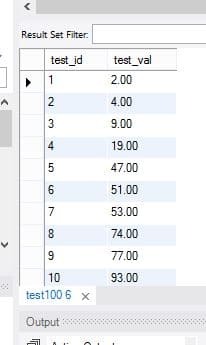 Step 2: select the max frequency value from our table of values and frequencies. Step 3: setup the unfiltered query. Step 4: add the query to filter on max_count, by specifying a where clause so that only values with a frequency count in the max count table (from step 2) are returned. Step 5: add a condition on max_count to ensure it is greater than 1, so we only return valid results when the mode exists (no mode if all the values occur only once). And that’s it. As you can see, it’s not entirely straightforward to calculate the median and mode values in MySQL, but it it’s not rocket science either. Hopefully this post will serve as an introduction to performing these calculations in MySQL.